TULP I & KLEEFSTRA R (2018) Andermans Veren. 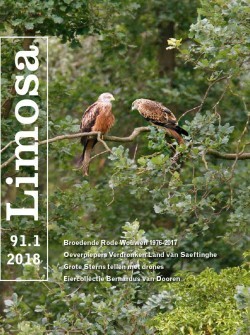 LIMOSA 91 (1): 44-47. Kolecek J., P. Proch´zka, C. Ieronymidou, I.J. Burfield & J. Reif. 2018. Non-breeding range size predicts the magnitude of population trends in trans-Saharan migratory passerine birds. Oikos 127: 599-606. Bellebaum J. & K. Koffijberg 2018. Present agri-environment measures in Europe are not sufficient for the conservation of a highly sensitive bird species, the Corncrake Crex crex. Agriculture, Ecosystems and Environment 257: 30–37. Clausen K.K., J. Madsen, F. Cottaar, E. Kuijken & C. Verscheure 2018. Highly dynamic wintering strategy in migratory geese: coping with environmental change. Global Change Biology 24: 3214-3225. Kölzsch A., G.J.D.M. Müskens, H. Kruckenberg, P. Glazov, R. Weinzierl, B.A. Nolet & M. Wikelski 2016. Towards a new understanding of migration timing: slower spring than autumn migration in geese reflects different decision rules for stopover use and departure. Oikos 125: 1496-1507.